What really happened to Malaysian flight MH370? Malaysian airlines flight MH370 flew into an EMP pulse in-progress, as a result all electronics on board were electrically destroyed leaving the pilots flying blind. This explains why cell phone calls were not made nor returned. 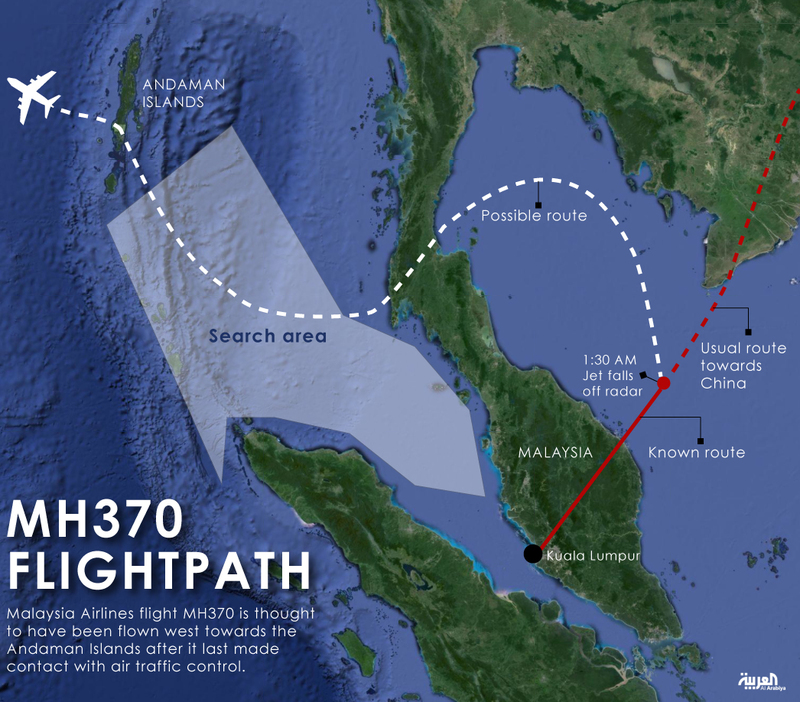 It also explains the odd protracted flight path of MH370. Information from ZetaTalk – Art by Chris Thomas. With condolences to the family and loved ones of the passengers and crew of the March 8th, 2014 Malaysian flight MH370, it’s fate was unavoidable. The electronics aboard the aircraft were destroyed by an enormous electro-magnetic pulse, otherwise known as an EMP. The pilots had no way of navigating a jet aircraft without their instruments of high flight where no landmarks can be seen, most especially over the ocean (image, below-left). Of course, privileged hierarchical government leadership would never alter a national airline flight plan because of the threat of an EMP. Questions would be raised: “What would cause an EMP Pulse that was so powerful that it could destroy the all the electronics within a Boeing 777 in the blink of an eye?”. ZetaTalk explains that magneto-electrical hot spots lurk in the upper atmosphere in areas above Earth’s compressing continental plates and the highly-magnetic Mid-Atlantic Ridge. The (top-most) image attempts to show the electro-magnetic – Planet X dynamics that are making this possible. The only missing ingredient in the image is the detail as to how such electrical activity is conducted to-the-ground is caused: which is by humongous planetary forces crushing rock mantle together facilitating a gargantuan electrical flow from above. Of course, the honest answer by the power elite would be that it was caused by a nearby, very dense and highly-magnetic brown dwarf, in point-of-fact, Planet X or Nibiru. But as many of us know, the elite hierarchy of the world had decided over 30 years ago to keep the presence of Planet X a secret. Instead, a cacophony of lies, half truths and “published” works seeded with disinformation began to descend upon us once the internet was up-and-running by the early 1990s. By then they had concocted “Global Warming”(G.W. Theory), which has now morphed to “Climate Change” as a cover for what they knew was to come. The covert “think tanks” also decided to hedge their bets by pursuing another elaborate lie: the (false) threat of a CME from the Sun. Benign ETs saw that coming and laid down the crop circle: Woodbridge in 2004 to clearly refute any thoughts of the Sun as a threat. What is an Electro-Magnetic Pulse anyway? These can be created in many ways, natural or man-made. Essentially when you “turn on” any electric motor like an egg beater, a table saw or an electric lawn mower, it emits a tiny, tiny emp pulse and if you have a radio on at the same time, you can usually hear a simultaneous pop or a buzzing sound, this is related to an EMP. Natural EMPs are caused by a CME (Coronal Mass Ejection) from the Sun, fortunately the Earth is protected by a powerful magnetic field: the magnetosphere that extends tens of thousands of kilometers beyond the upper atmosphere in all directions. So all is in natural balance. Also, consider that a Faraday cage is the only defense against an EMP. A Faraday cage is anything from a metal box, a fine-wire mesh cage to just a sensitive electronic device wrapped with aluminum foil. A Faraday cage will conduct the EMP as electricity around the enclosed electronic device protecting it from internal electrical surge. Consider also that a Boeing 777 has a shell of aluminum as a skin over a metal frame, so is a Faraday cage in itself. Faraday cages also have to be “tuned” to different frequencies of EMPs to most effectively fend-off an immensely powerful EMP. 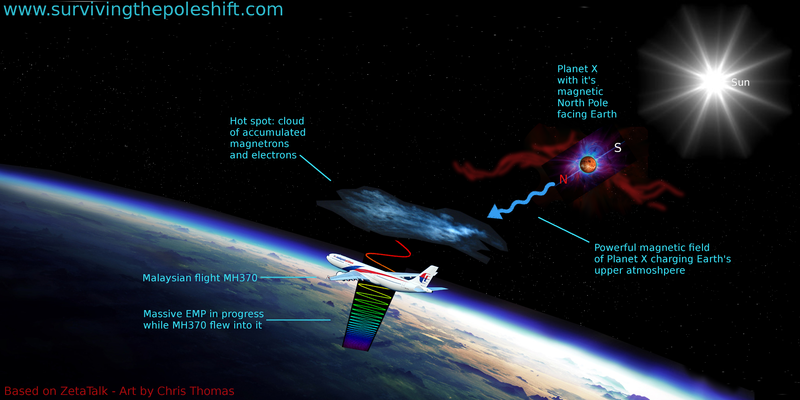 So the Malaysian Flight MH370 is a sad testament to the extreme power of the magnetic – electrical forces in play between Planet X and Earth. For those interested, there have been several EMP events in the last few years that were caused by Planet X. But let’s first look at a few aspects of Planet X to facilitate understanding of the forces at hand. The corpus of Planet X is a “failed” or cooled star known as a brown dwarf. According to Zetatalk, it is 27 times as dense and 4 times larger than Earth. Planet X has a mammoth tail of moons and planetary debris accompanying it which is highly-charged with electrical potential. In fact it was a swipe of this tail that caused the Northeastern and Midwestern U. S. and the Canadian province of Ontario blackout on Thursday, August 14, 2003. This coincided with the arrival of Planet X in the solar system when the dwarf star came to a sudden slow-down and the tail kept going to pass close enough to Earth to cause the blackout. The Air France flight 447 (an AirBus A330) that was lost in the Atlantic on June 1st 2009 due to an EMP while it flew over the highly magnetic mid-Atlantic R idge. 1. – The compression of the Sunda Plate will not ease, as the lifting of the Indo-Australian Plate under pressure from the Pacific will be continuous. 2. – Likewise the pressure on the Caribbean Plate, including Central America, pushed down and westward as S America rolls. The Caribbean has shallow water in many areas so potential EMP points could be gauged. 3. – Where the St. Lawrence Seaway is mainly being pulled apart, there are pinch points inland which could result in EMP, especially if under water along the shores of the Great Lakes. 4. – The Sea of Japan, the East China Sea, and the Sea of Okhotsk are all under shallow water and will be under continuous pressure as the Pacific compresses. 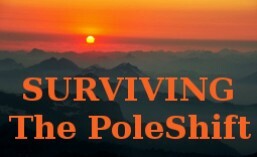 In conclusion, the dangers of air travel have just had the ante upped in the gamble many take for granted and will only get worse from now on through to extreme danger in the months leading up to the Pole-Shift. Basic message credit to ZetaTalk.com – Art by Chris Thomas. This entry was posted in News Commentary, zetatalk commentary and tagged air france 447, chris thomas, earth poleshift, electro-magnetic pulse, EMP, fate of Malaysian airlines flight mh370, fate of the mh370, global pole shift, malaysian airlines flight mh370, malaysian flight mh370, mh370, nibiru, planet x, what happened to mh370, where is mh370, zetatalk commentary, zetatalk report. Bookmark the permalink.